List Rules Vote up the funny moments from the Simpsons that you missed the first time around. To work on The Simpsons, you've got to be pretty darn intelligent. Many of the writers graduated from top tier colleges with degrees in mathematics and science and it shows. A lot of the gags on the show are beyond what children can understand, but some are so smart they can be baffling to adults as well. You might be familiar with The Simpsons' most adult gags or its best gags that targeted religion, but these smart Simpsons jokes went over your head decades ago and probably stayed there. "Sneed's Feed & Seed" was formerly called "Chuck's." Notice that all three words (Sneed, feed, and seed) end with the same sound. 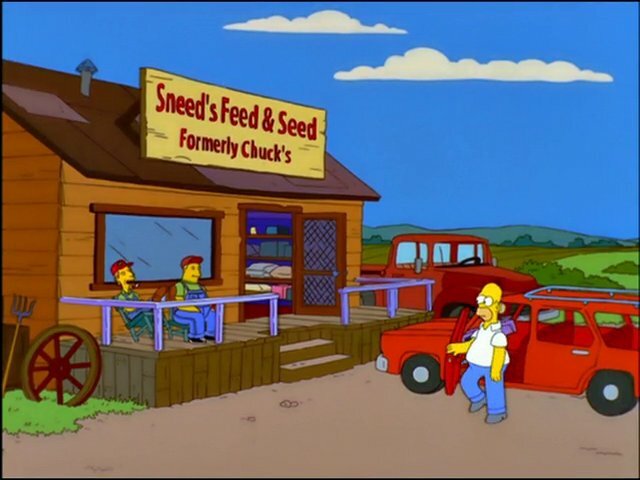 Now, replace "Sneed's" with "Chuck's" and follow the pattern, so that "Feed" and "Seed" end with the same sound as "Chuck." Yeah. That's pretty dirty for a sight gag. In the Season 10 episode "30 Minutes Over Tokyo," the Simpson family heads to Japan after getting some very cheap plane tickets. Homer doesn't want to go, but Marge tries to change his mind by pointing out that he loves Japanese things, including the Akira Kurosawa film, Rashomon. 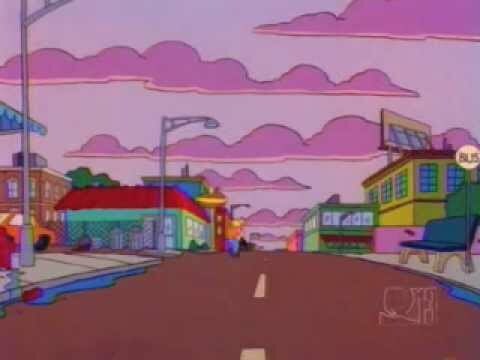 Homer replies that he does not remember it that way. Rashomon's entire plot revolves around an event remembered differently by different people. Paul and Linda McCartney guest starred in the episode "Lisa the Vegetarian" in 1995. While visiting with Lisa, Paul mentions that if you play the song "Maybe I'm Amazed" backwards, you'll hear a recipe for a delicious lentil soup. The song plays over the episode's ending credits and true to their word, if you play it backwards, you will actually hear Paul read a recipe for lentil soup. 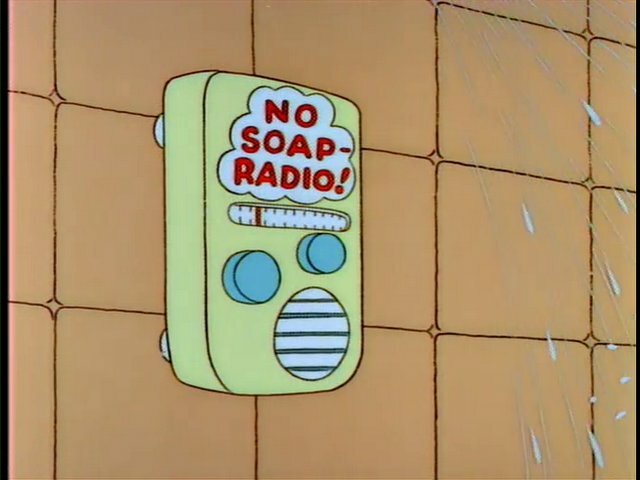 Inside the Simpsons' shower is a waterproof radio, labeled as a "No Soap, Radio!" "No soap, radio" is the name for a kind of surreal practical joke, in which the punch line has no relation to the content of the joke and is seemingly a non-sequitur.